Mozart was 16 when he composed Lucio Silla but it remained the last opera he wrote for Italy for after the opera premiered during the Carneval season of 1773, the Regio Ducal Teatro (for whom Mozart wrote Mitridate and Ascanio in Alba) did not commission any more operas to Mozart. The opera has no easy or proper plot, which is not uncommon in operas of that period. Although the librettist Giovanni de Gamerra went on to play a small role in the development of what was to become romantic opera, the characters in Lucio Silla are very static. Mozart composed a varied palette of music, some conventional pieces, others remarkably deep, using some new and elaborate forms, a considerable amout of recitativi accompagnati-a more dramatic form than the recitativo secco-and expanding the orchestra with trumpets, giving the orchestra more elaborate writings then relegate it to a standard accompaniment. Recitivi were written when still in Salzburg while the arias were composed tailormaid to the strengths of the singers. They all turned up in Milan between end of November and beginning of December 1772. The first Cecilio was the famous castrato Venanzio Rauzzini, while the first Giunia was Anna de Amicis, equally famous. De Amicis “was very satisfied with the arias, and Mozart introduced in them passages which are very unusual, unique and extremely difficult and which she sings amazingly well…” father Mozart reported, who was in Milan with his son. Giunia and Cecilio each sing in 7 pieces. And Mozart gives them a wonderful duet to close Act I. Lucio Silla himself sings only in 3 pieces, which is either due to his text written to be conveyed dramatically by the recitativo or by the fact that the originally intended star had to be replaced last minute with a lesser known singer, or both. The new tenor arrived December 17th and the next day Mozart had composed the two arias for him. Cinna has also only 3 arias but has the privilege to sing the first, while Celia’s role lightens the atmosphere, seen that she is not included in the political plot. The full orchestra rehearsals were done the 18, 20 and 22 December, the dress rehearsal the 23rd and the opera was performed the 26th and run for 26 performance, a considerable amount. Mozart was pleased with both Anna de Amicis and Venanzio Rauzzini, and for the latter, around the 15th January, he composed the famous motet Exultate, jubilate. The director sets the story in modern days and when the curtain rises, one sees a modern house (which later revolves) and tress around it, very much like in Pizzi’s Pietra del paragone, but less stylish. But the plot is quite thin, the da capo arias very long and Tobias Kratzer really only asks for very conventional movements (except for much cutting of veins and a dog running around) and the little action on stage starts boring very soon. The orchestra played the ouverture swiftly and nervously (maybe a bit too nervously?) but Manacorda directed and accompanied very well. I thought Jeremy Ovenden was just acceptable. His lower register weak, his interpretation extremely thin. Much better Lenneke Ruiten. Her role has extreme demands and she manages well with a beautiful and bright top register. In one of the most difficult arias ever written Ah se il crudel periglio she convinces much less (drops a note every now and then to breath). Anna Bonitatinus gave a lovely recital of Rossini songs a couple of weeks back. A forgotten repertoire that she rendered beautifully. But her Cecilio was not as convincing. Her tight vibrato is a bit unpleasant and it seems to me Cecilio is a size too big for her. Her 2nd entrance aria was sung with much transport and fury and was a joy to hear, as was her last aria, but there are constant struggles with pitch. Marvellous Simona Saturova as Celia. She sings her four arias wonderfully and with great taste. I had big hopes for the opening aria but i had to wait for Ilse Eerens to sing her other two arias which allows her to show her bravura. I like her beatiful timbre and clear top notes. Good also Carlo Allemano but untidy roulades. A breathtaking performance: The conductor leads the motivated orchestra wonderfully, bringing to light the varied palette of colours of Humperdinck’s score. The singers sang a concert performance but behind the orchestra a screen showed a mix of projections, shadow puppetry and life acting which was all done and performed life outside the stage and projected same-time onto the screen. The effects were stunning. The creators brought me into a magical fairy tale world showing that lower budget productions can be as enjoyable as famous-name productions. I, anyway, was fascinated. The singers sang well adding their bit to a marvellous evening. About two performances I did not report. One was the lovely Bohème at the Metropolitan Opera of New York, where Kovalevska, Lungu and Calleja all gave their best. Most memorable for me, however, was the enthusiasm of the American public, who carefully followed the text and reacted with laughter and clapping to show their appreciation and enthusiasm. It’s the kind of public we sometimes miss in Europe, where opera is sometimes just an occasion to be seen. Public is also more critic towards, well…almost everything (especially the Italians :-)), rather then just enjoy the performance. Of course this is sometimes due to a more traditional staging in the US than Europe…but here I open a whole new door…. I open a sidebar to praise and recommend the small and cosy Japanese restaurant Minca (536 E 5th St) where I had the best vegetarian Ramen I have ever tasted. Another beautiful show was Janacek’s Jenufa at De Munt in Brussels. 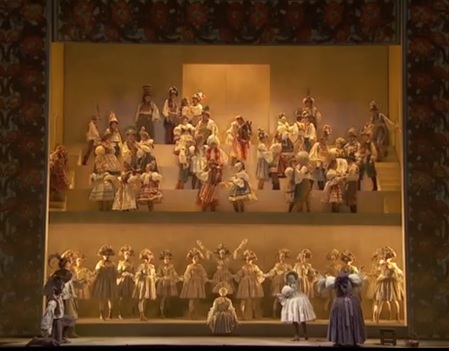 The director Alvis Hermanis presented Act 1 of the action with the singers at the front of the stage, while at their back the stage was horizontally divided in half with traditional-style dancing at the bottom. On the top, beautiful colorful pictures link the story. Sometimes the screen would lift to show us the chorus, also in beautiful costumes. This is in opposite contrast to Act 2, where Hermanis transports us into a cold, communist-like setting of the 60’s. Although much criticised, this setting worked well for me, it kind of led me towards the drama which was about to unfold. This is not really my musical territory but I liked all the singers, among which i want to single out the Jenufa of Sally Matthews, the Laca of Charles Workman, Nick Spence as Steva and Carole Wilson as Kostelnicka. All together a wonderful experience. Mr Morlot, in an interview he claimed Jenufa is among his top 10 prefereed opera’s, was also more inspired than usual. And now to Guillaume Tell. This is the 4th time I hear this opera in the last 11 months. But the music still amazes and moves me. The libretto is in its infancy of Grand Opéra and somehow a bit tedious. So let’s concentrate on the music and the performance at De Munt. Personally I think Evelino Pidò did a great job. He accompanied the singers well, gave them all the time to carve their interpretation, to develop their musical phrases. On rare occasions I would have wished the orchestra would follow Pidò’s gesticulation when he urged the orchestra to play piano (Sombre forêt), but otherwise the orchestra was in good shape with a delicate English horn, a sound brass, and a motivated timpani player, and accompanied well. The chorus was equally inspired and had an excellent diction, although I am always missing a bit of zest in the Italian repertoire in orchestra and chorus (and I consider Rossini as Italian also in his Paris years). The bass Nicola Alaimo has not a big voice but rendered a very convincing interpretation of Guillaume and a moving Sois immobile. I found Michael Spyres in much better shape than in Wildbad. His diction is excellent and hearing him sing makes look Arnold’s part like a piece of cake. But the tessitura for the heroic Arnold, which Spyres interprets with vigor rather then boldness, lies very high, and Spyres resolves this with a cleverly used mixed voice. I was less satisfied about Ermonela Jaho’s Mathilde. Nothing REALLY dramatically wrong vocally (although her coloratura in the Act III aria was very smudged), just her interpretation did not convince me. I particularly enjoyed Nora Gubisch’s luscious mezzo, Eerens’ clear soprano, Marco Spotti’s authoritative Walter Furst (in both the approach of the character and voice), the assertive and full-voiced Gesler of Vincent Le Texier and Julien Dran’s secure acuti of the fisherman Ruodi. Jean-Luc Balestra has a very strong and powerful, smooth voice, which, when skillfully used, can be adapted to a wide range of characters and emotions. I was less taken by Roberto Covatta’s Rodolphe. 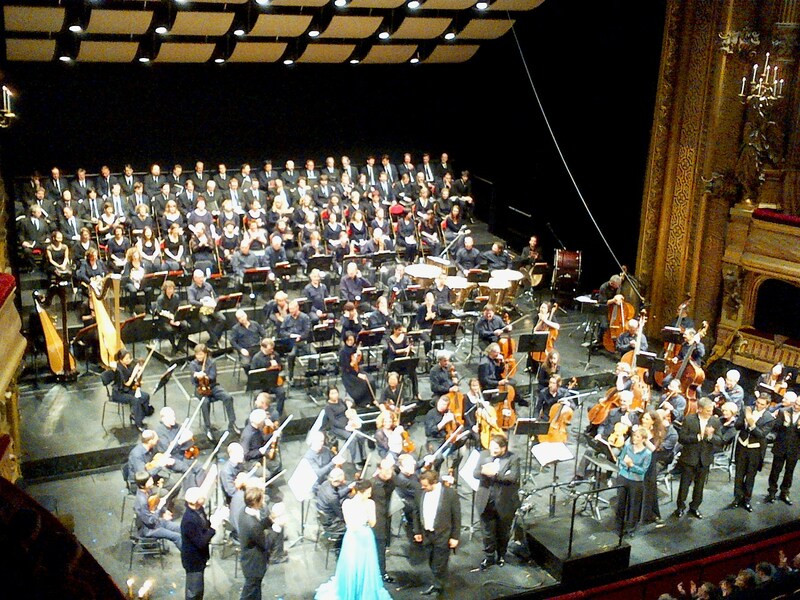 All in all an evening above average with the Brussels public at its most typical, with no or hardly any applause during the opera (applause at the end of Arnold’s Act IV aria sounded like one applauds von Winter’s chamber music) with the a few “obbligato” bravo-shrieks.